After the burial of the late Ferdinand E. Marcos Sr. at the Libingan Ng Mga Bayani, the Nobitards decided to strike further by declaring that they're at an all out war against the Duterte Presidency. To ease the Nobitard crowd, President Rodrigo Roa Duterte said, "Fine! You are angry that Marcos was buried there, don't worry! We have a special compensation for you. 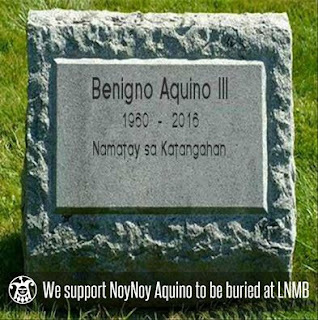 Since Nobita Aquino said he was willing to die to preserve his father's heroic legacy then you can bury him in the Libingan Ng Mga Bayani when he dies!" To everyone's surprise, President Duterte went to the Libingan Ng Mga Bayani to prepare a slot for Nobita when he inevitably dies. The location for former president Nobita's would be burial site was reserved to be right next near to Marcos Sr.'s remains. Other people who are considered to get a heroes' burial are Jejemon Bitay, Antonio Trillanes IV, Gary Alejao, Liar Dilemma, Etta Rosales, Stinky Soliman, Mar Roxas, Joseph Emilio Pabaya, Alberto Looney, Jose Devil Honrado, Andres Bautista, Chito Gascon and Alan Impurisima. Add Kill Henares, Krisis Aquino,Korina Sanchez, & Raissa Robles to the LNMB list.